*Conditional Rebate Offer: Participation is included at no additional charge. Please see complete official rules for full terms and conditions and activation requirements of this conditional rebate offer. Official rules are available at Universal Nissa, 12785 S Orange Blossom Trail, Orlando, FL 32837. Your purchase or lease of a new Nissan Kicks from Universal Nissan has qualified you for the chance to receive their first year of car payments paid by Universal Nissan (if financed), or a flat amount of $3,000 cash refund (if not financed). All sale contracts, financing and payments must be fully completed and approved during the eligible qualification period: 8/1/18 â 9/3/18. Conditional rebate offer not valid or available on any purchase or lease made prior to 8/1/18 or completed after 9/3/18. Any customer who makes a qualifying purchase or lease of a Nissan Kicks vehicle between the Qualification Period will automatically be qualified for the Conditional Rebate Offer. In order for the conditional rebate offer to be activated (i.e. 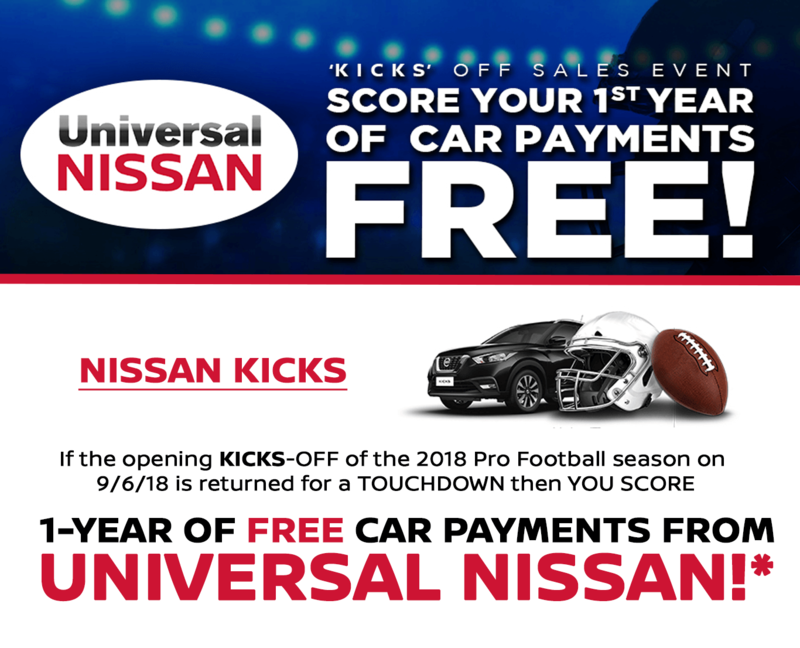 in order to receive your first year of car payments paid by Universal Nissan, or a refund check of $3,000), the opening kickoff of the game during the professional football game being played in Philadelphia, PA on 9/6/18 (season opener) must be returned for a touchdown per the complete official rules and terms and conditions. If the opening kickoff of the designated game is NOT returned for a touchdown per the requirements in the official rules, then the conditional rebate offer is void and will not be awarded, and you will not be entitled to any refund or rebate amount in any manner. Offer void where prohibited.